Intel’s drone team have taken to the skies in yet another record-breaking drone flight. This time around, Intel’s drone team has taken over the skies with two thousand and eighteen of their shooting star drones. Intel is no stranger to drones, from their enterprise level drones to their advanced drone software. Intel has been performing and evolving these drone sky shows since their launch back in late 2015. Why did they put so many drones in the sky? Intel is celebrating their 50th anniversary as a company this year. What’s better than sending two thousand and eighteen drones into the sky? I’m sure when Intel first came about they didn’t think they would be celebrating their 50th anniversary with drones. This flight has gained the Intel drone team yet another Guinness World Record, surpassing their previous record-breaking flights. This flight showed off a couple of images we haven’t seen before. The drones took to the sky to create a special 50th-anniversary edition of the Intel logo, a globe, a couple of people dancing and what looks to be a camera shaped object. 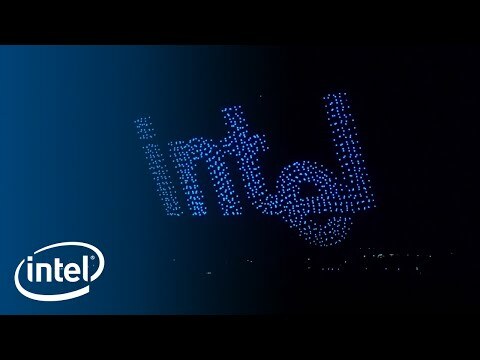 Intel’s drone team started in late 2015 with their first drone light show in early 2016, comprising of one hundred drones flying in unison. This was then improved upon in late 2016, with their five hundred drones light show. However, Intel’s drone team did not stop there. Earlier this year Intel’s drone team went to the Winter Olympic games to pull off another recording breaking drone light show. Intel sent one thousand two hundred and eighteen drones to take over the night sky. This was of course in celebration of the Olympic games, showcasing various Winter Olympic sports in lights. Why does Intel do this? You might think Intel is doing these drone light shows for publicity, that’s not the case at all. Intel is looking for safer and cheaper alternatives to the current sky based entertainment methods. This includes fireworks, which Intel is taking on head first with their drone light shows. If a solid entertainment business is not enough to convince you, remember that Intel is constantly advancing their drone swarm technology, readying it for commercial operations for search and rescue or rapid commercial inspections. Intel’s drone team are advancing at a steady rate and it doesn’t seem like they will be stopping any time soon. These drone shows have been met with open arms from many people the world over. Do you think Intel’s drone shows are a good investment for the future of the company? Share your thoughts with us in the comments below or head over to our social media accounts.